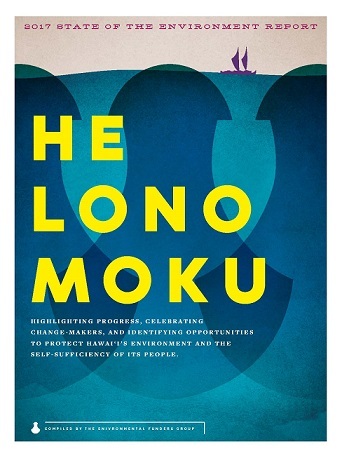 As a member of the Hawaiʻi Environmental Funders Group (EFG), Hauʻoli Mau Loa Foundation assisted in the development and release of He Lono Moku. The EFG is a network of philanthropic individuals and institutions engaged in active grantmaking to promote environmental and community sustainability in the Hawaiian Islands. One of the most timely platforms of collective knowledge we have in Hawaiʻi today, is the Aloha+Challenge Dashboard (https://dashboard.hawaii.gov/aloha-challenge), which actively and continually tracks our progress toward six sustainability goals for the state. Each year, He Lono Moku uses this platform to highlight and share progress on a variety of environmental topics. This year’s report shares our advances in invasive species, local food production, and green business. Since 2011, Invasive Species Prevention in Hawaiʻi has been one of Hauʻoli Mau Loa Foundation’s core environmental programs and we’re excited to share the critical information on “invasives” in the report. The Foundation works closely with the Coordinating Group on Alien Pest Species (CGAPS) in supporting a wide variety of invasive species prevention efforts on an annual basis. Christy Martin of CGAPS is featured in the report and provided expert insight and information. Please go to www.hawaii-environment.com/report to read and comment on the report. A special thanks goes out to Sheila Sarhangi and Lavonne Leong for their writing and editorial oversight, as well as to Janelle Kalawe-Ching for her graphic design wizardry. Also, mahalo to Eric Co of the Harold K.L. Castle Foundation for serving as chair of the EFG report committee.